It’s been about a week since my annual Thanksgiving food coma, so I figured it was time to get another burger. For this one, I went back to a regular spot of mine. Your Father’s Moustache, located at 5686 Spring Garden Road, continues to be a favourite place of mine as they have many different delicious options to choose from. 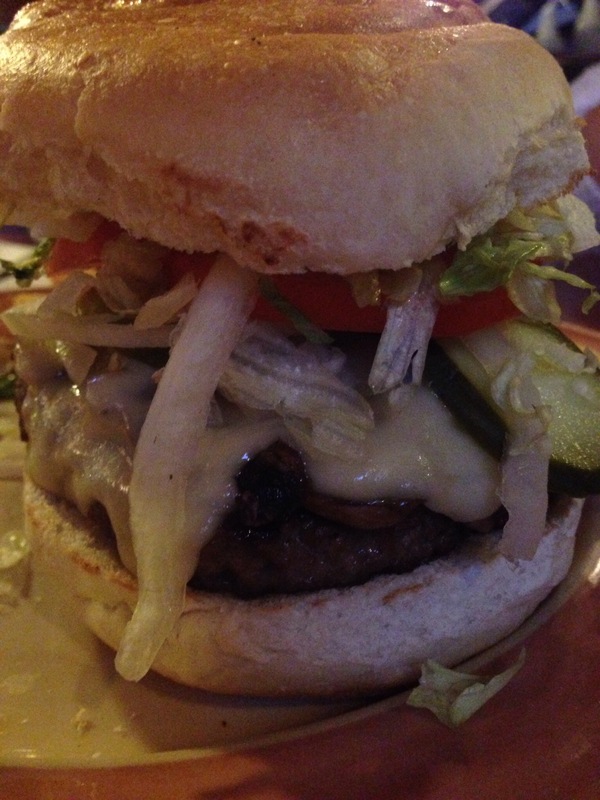 This was my second burger-related visit, and this time I went with their Mushroom & Swiss Burger. The first thing that you notice about this burger is the pile of Swiss cheese and mushrooms that sits on top of the burger patty. When they say smothered, they mean it! 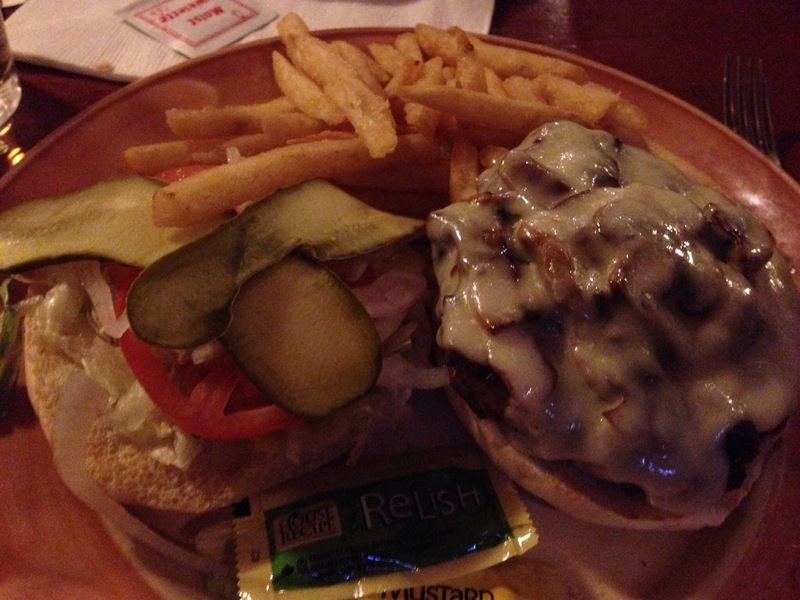 In comparison, everything else on the burger didn’t really live up to the mouth-watering appearance of the cheese/mushroom combination, but that didn’t even matter to me because I was more focused on the cheesy goodness. After the first couple of bites, I was in love with the Swiss cheese and mushroom combination. The mushrooms tasted really delicious, and when added with the melted Swiss cheese, they really came together to create a delicious flavour. My complaint with this burger was that aside from the cheese/mushrooms, there really wasn’t any other flavours to give it that extra kick. I think this burger could really benefit from possibly a garlic mayo or something along those lines, just to add a bit more taste and kick it up a notch. We arrived here on a Friday night around 7pm and it was pretty busy. There were many different groups of people, ranging from families to groups of students. Your Father’s Moustache is pretty good at catering to most groups of people, and that’s why it tends to be a pretty popular spot. Despite it being busy, our waitress was friendly, and didn’t appear to be stressed out about the number of customers she had. Our food came out fairly quickly, and it was a pleasant experience all around. The cost of this burger is $13.25. I believe that this is a fair price for what you get. It’s loaded with mushrooms and cheese, so that alone makes the price worthwhile. I think that if they cleaned the burger up a bit and added some more flavours that they could even get away with upping the price a bit. I was pretty happy with this burger. It was both filling and it tasted great. It isn’t the best burger I’ve had, but it is definitely a nice burger that I would get again on a return visit.